The nicest looking Terminal I’ve found is at Todd Werth’s blog http://toddwerth.com/2011/07/21/the-original-ir_black-for-os-x-lion/.I made some minor modifications to suit my purposes. Then add the following lines to the .bash_profile file found in the user home directory. If not found, browse to the home directory in Terminal and type “touch .bash_profile” and then “open .bash_profile”. This entry was posted in Uncategorized and tagged Mac OS X, Terminal on October 18, 2013 by Simeon Lobo. I’ve had this weird proxy authentication issue that prevented me from connecting to the internet via Firefox on a Mac from behind a corporate firewall. I switched a couple of authentication options for Firefox as shown below to solve the problem. 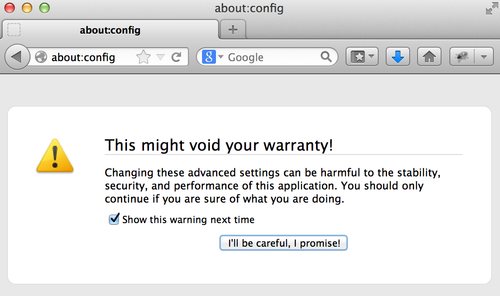 Open an instance of Firefox and type in “about:config” in the address bar. Click the “I’ll be careful, I promise” button. 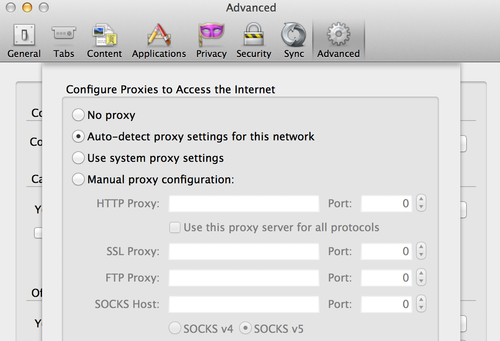 In the Search field enter “network.negotiate” and select the “network.negotiate-auth.allow-proxies” settings row. Double-click the row to change the Value to “false”. If you’re using a Microsoft ISA proxy server, this setting effectively disables SPNEGO client-side and gets you through. In the Search field enter “network.automatic” and select the “network.automatic-ntlm.allow-proxies” settings row. Double-click the row to change the Value to “false”. If you haven’t attached your machine to a Windows domain, this setting prevents Firefox attempting to silently “single sign-on” to the ISA proxy using your non-domain credentials (and therefore failing the authentication challenge). Go to Firefox -> Preferences -> Network -> Settings and click to select the “Auto-detect proxy settings for this network” radio button option. In the event that you need to use a Cisco VPN client to connect remotely, the latest version of the Cisco VPN client (v3.1 as of this writing) must be used. The above settings (Step 1 – 4) should work seamlessly, connecting you to internal and external web sites even when you’re on the VPN. This entry was posted in Uncategorized and tagged Firefox, Mac OS X, Proxy on October 16, 2013 by Simeon Lobo. In 2004, for every 56 Windows devices sold, only 1 Apple device was sold. A new report has emerged that reveals that the ratio has now dropped to below 2. In terms of Windows PC versus Mac OS X, Windows sells 19 units for every unit Apple sells. Analysis reveals that the ratio of PC’s versus Mac’s is the narrowest since the 90’s. My take is that the tablet market is a major contributor to the decline of the PC market, rather than Mac’s posing a genuine threat at this point in time.